For me, one of the largest lessons of this election has to do with the ears of America. In a general sense, they are closed. This is not something I did not know, but I have been mildly surprised by the severity of this self-imposed deafness. After the election, the voices of the public are just as polarized as before the election. My friends told me about needing to console students who were vomiting out of fear and emotional trauma. People were marching in protest in the streets. Hillary supporters were encouraging the assassination of the President elect. Trump supporters were gloating and acting like Trump, shouting the worst of prejudicial slurs, or threatening gay, Muslim and Mexican Americans. America woke up to a President elect born from the sewage of Reality TV. I spent most of the day counseling people. They were screaming. They feared for their lives, or the lives of their friends. Other pastors were overwhelmed dealing with fallout of those whose candidate lost the election. My thoughts about how we got to this place are many. They are beginning to fill tomes. 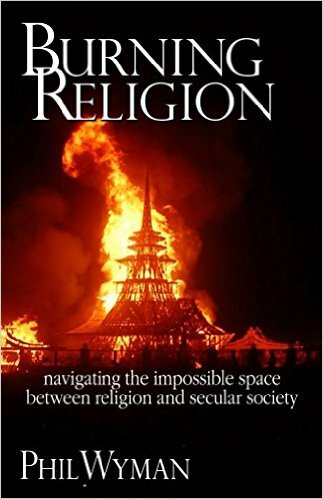 I began the work of navigating this space between our disagreements in Burning Religion. This election has provided evidence that my observations on the distance between us is a legitimate and major concern, and it has also provided fodder for my developing thoughts as I work on Burning Religion part 2 – Clowns in the Pulpit. Over the coming days, I will unpack some of my many observations about this dangerous distance between the peoples of America: the progressive and conservative, the urban and suburban/rural, the white and non-white cultures, and the young and the old. Certainly, it has now become impossible to deny that we are a divided nation, without ears for one another. This does not mean that there are no listening heroes among us. Rather, it is the simple observation that many of us have planted our feet firmly on our soapboxes. We are becoming fundamentalists. We are bullhorn street preachers. We are becoming more like the enemies we perceive around us than we can imagine. Excuse my extreme mysticism, but a story of a peculiar event that occurred to me over 30 years ago seems an appropriate addition here. I had an ecstatic dream-like experience, which makes more sense today than it did then. Waking up in the middle of the night, sitting bolt up in bed, I heard a voice in my head. The thick Nigerian accent spoke repeatedly, “Before the ministry begins, one must go about preaching in the churches.” In a trance-like state I repeated the words, wondering about this strange saying. I asked myself out loud, “What does this mean?” After thrashing and turning in bed for a few minutes, all the while entranced by these words, a paraphrase of a Bible verse popped into my head. I spoke the words, “judgment must first begin in the house of God,” and I shouted, “That’s it!” I immediately plopped my head upon the pillow and fell straight back to sleep. In the morning I awoke with these words burning wildly in my heart and mind. That wild experience has haunted me all these years, and has seemed so distant and indefinable. Today, if 1 Peter 4:17 ever seemed applicable, it is after this election with the extreme cognitive dissonance which has been clearly displayed in American Christianity. “Each fundamentalism becomes a misunderstood subculture to the surrounding dominant culture, and treats the dominant power as the dangerous other, while simultaneously being treated by the dominant culture as a dangerous other. Here the other begins othering others, while misunderstanding and distrust are magnified and exaggerated in this hopelessly isolating cycle of othering. If you would like to support or perhaps join Phil in this movement, and the upcoming ministry of developing micro-churches in festival settings, and challenging Christianity into new spaces of grace and outward focus, you can give here, and contact him here, and sign up for a periodic newsletter here. * The etymology of “ to follow suit” comes from following a play in a card game, which requires following with another card of the same suit. It’s usage as doing the same thing as another person or group dates back to the early 18th century. Appropriately, as a play on words, it fits the way politics and the American public is being led by the nose to do what the “suits” of big business demand. Here is some amazing insights from an amazing person.